Lane Wilcken is a mambabatek or cultural practitioner of the ancient hand-tap tattooing traditions of the Philippines. He specializes in the traditional symbolism of the Philippines and applies tattoos as a spiritual practice. Lane constructs all his own tools using wood, horn, bone, and thorns to make his tattoo impliments. 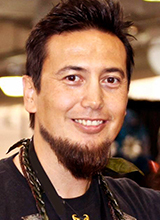 Lane has studied the tattoo practices of the Philippines for over 22 years and is the author of "Filipino Tattoos: Ancient to Modern" and "The Forgotten Children of Maui: Filipino Myths, Tattoos & Rituals of a Demigod." He is also the former Editor-in-Chief of 808ink, Hawaii's premier tattoo magazine. Joseph Bautista has been involved in Filipino Martial Arts (FMA) since 2003. It was a way for him to learn more about his culture and heritage. In 2009 he and his Grandmaster opened up ESKABO Daan, the only FMA School that only teaches FMA in the nation. In an effort to preserve and promote the rich history of FMA he has done countless performances, seminars and lectures. After 5 years of building up Eskabo Daan he was able to quit his job for the Department of Homeland Security to be able to focus entirely on FMA. For the event, they'll launch into a short educational piece on colonial mentality within the psychological literature, that includes their own personal anecdotes. They'll then talk about decolonization and some of the adverse psychological effects of colonial mentality and end it with a discussion with the audience.